The preferred method of handling the logistics of a loyalty rewards program in a restaurant is with an integrated system in which the loyalty platform and the point of sale (POS) platform communicate with one another. The POS passes member data (card number, even if that card number has been retrieved via phone number or name look up as is quite common these days) and purchase data to the loyalty system. The loyalty system passes reward data (if a reward exists and is being used by the member on the transaction) back to the POS to be inserted into the check (as a discount or as a tender type). This approach is smooth and clean. We hear from restaurant companies and operators who cannot achieve the integrated approach for one reason or another. Some of these companies are looking for an alternative method of collecting guest data which stands alone as a separate system and is not connected with the POS. This approach has its downsides and risks (reconciliation and potential fraud) but if a restaurant company goes down this path with eyes wide open it may be a better alternative than doing nothing. My purpose here is to outline a potential approach or framework, envisioning a stand-alone, web-based computer system (simple loyalty, or, better yet, ‘Loyalty Simple’) that handles the most basic loyalty system functions and provides the most basic reporting functions to support the reconciliation to POS reporting. Adding guests to the system. Performing basic inquiries about guests, their profile information and their purchase/points/rewards history. Allowing guests to register themselves for online access to view their profile and history. This Loyalty Simple framework works best in a limited-service restaurant with few POS stations and a moderate number of daily purchase transactions (100-200 per day). It can be handled running on a small laptop or tablet device. For the purposes of explaining this framework, we won’t go into detail about exactly how this hypothetical loyalty program works, let’s just assume a member earns points that convert to rewards and that those rewards may be applied to a check in the restaurant as a discount. In many programs, a membership card exists. However, in many instances, members don’t have their card with them when they visit the restaurant and most companies have developed alternate lookup capabilities, the most common of which is by phone number. The expectation has been created over the past several years and this capability is now expected by guests. So, in our framework, imagine there is no card. It’s all based on your phone number. Here’s the situation. The guest is in the restaurant and wishes to join the loyalty program right now and earn points on the purchase he/she is about to make. What do we really need to collect? This can be accomplished quickly to create a record for this guest so that you may begin recording purchase transactions by phone number. The reason we say ‘maybe’ when it comes to e-mail address is that the e-mail capture could be a subsequent step that the member may perform later online as part of a more complete registration process. The challenge with collecting e-mail addresses at POS is the address should be entered twice to reduce typing errors and some e-mail addresses these days get a little complicated. We don’t want to slow things down at POS. A member is making a purchase, identifies himself as a member and provides a phone number (the member has already been added to the system, either on a prior visit or just prior to making this transaction). After entering the phone number, the system identifies whether or not there are rewards available. If rewards are available, the member may choose to have those rewards applied to this check. The server input the gross amount of the check and selects the reward amount to apply. The system adds a transaction record with basic information (phone number, date, time, location, gross amount, rewards applied, net amount). The member’s balance is updated in the member record (adding points earned, deducting rewards redeemed). 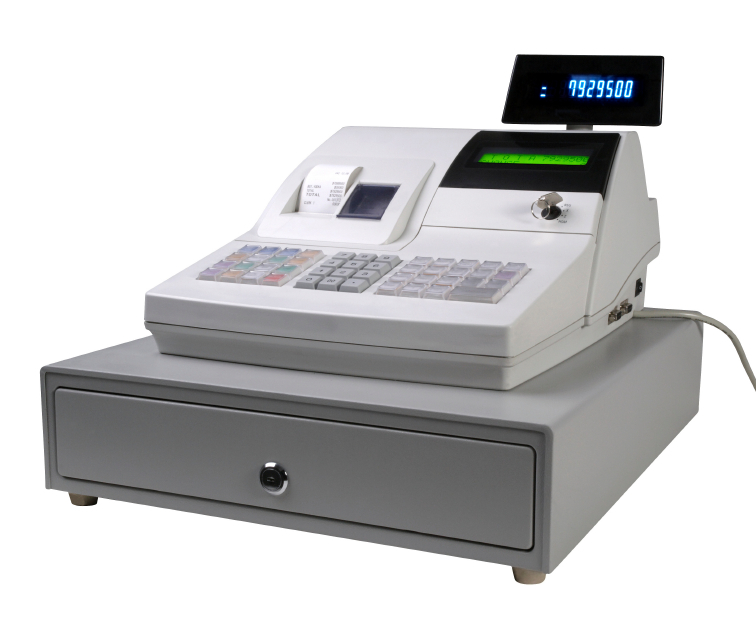 The system displays a summary screen for the server so that the server may perform the action required at the POS to insert the discount (from the reward) if a reward was used. The transaction records feed end of day reporting that lists all loyalty-related transactions so that they may be reviewed and the rewards redeemed may be compared to total discounts applied at the POS. Store personnel may look up members to view their profile and history by phone number or name and view their information, balances (points and rewards) and view a history of their transactions. Basic reporting may include lists of transactions for general review and reconciliation and to understand how many points have been awarded for the day, week or month if the restaurant is accounting for points awarded for an expense accrual. Also, member lists may be available for general review and for a total of outstanding points and rewards balances, once again for any accounting action depending upon how the company is handling accounting for their program. All reports should be available for export to Excel for additional manipulation, analysis and examination. This would also allow for transferring e-mail addresses from the loyalty system into whatever e-mail platform might be used by the restaurant company for general communication activities. This is increasingly a standard and expected function. Members may have an account established in the loyalty system and then access the account through the restaurant company’s website. The first time the account is accessed, the member establishes a password and provides an e-mail address and any other desired information. The member may log-in moving forward to review/edit their profile information, balances and history. The best approach is an integrated loyalty system and POS. But if it’s just not possible for your company for whatever reason, this Loyalty Simple framework might make sense. If you go down this path with your eyes wide open and understand the requirements of operating with such a framework it may be your best approach. The pizza segment of the restaurant industry has been and will continue to be a major competitive battleground. The combination of national, regional and local competitors and the heavy delivery/carry-out component provide some unique dynamics as compared to more traditional casual, fast casual and QSR restaurant brands. Because many of these brands have been collecting customer data for years (to facilitate the delivery process), the development and implementation of loyalty/rewards programs is not as logistically complex as it is in many other restaurant companies. These companies already connect customers with purchase transactions and that’s more than half the battle. 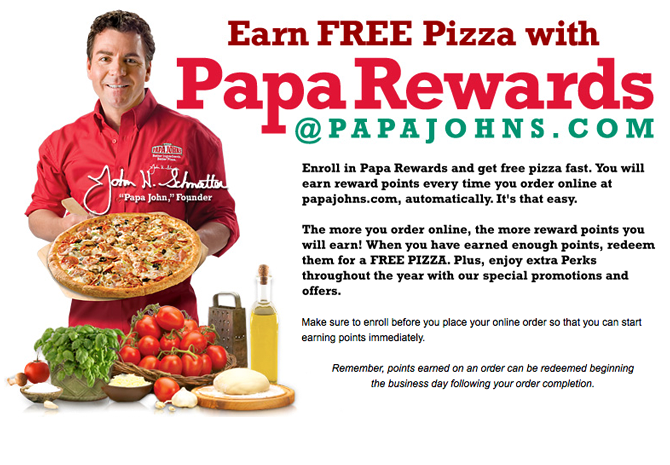 Papa John’s has already jumped on the bandwagon with Papa Rewards. It’s simple to participate and the program rewards members for orders placed online. To participate, you simply register online and from that point forward, as you place orders online you earn points in your Papa Rewards account. It’s a fairly rich proposition too – for every $25 you spend, you earn a free large pizza with up to three toppings. Earn 1 Papa Rewards Point for every $5 you spend, including tax and delivery, on every purchase from your papajohns.com account. You are eligible for a FREE large pizza with up to three toppings when you have earned 25 Papa Rewards Points. Look for other special offers for Papa Rewards members throughout the year, but you must opt-in to receive promotional and marketing emails from Papa John’s. For more information, visit the Papa Rewards website. We look for more activity in the pizza category. Stay tuned.